There are certainly lots of fall and winter chores to do. Come into Durfee’s today and get your windows and screens repaired so you won’t lose heat during the winter. Be sure to replace that old, broken rake and grab and arm-full of bags for all that yard waste. We’re always here to help with suggestions on the right tools for the job. Maybe it was the Depression-Era mentality or maybe it was just his personality, but my Dad was all business. Sure, he’d show-up to his grandchildren’s milestone events, but he just liked working at the hardware store. All of his grandchildren even worked at the hardware store at one time or another. His grandson Ryan is now running the store with my brother Paul. While I knew having my kids work at the store would be a good business experience, part of why I sent them there was to develop a relationship with their grandfather. He was truly a great guy, and I’m not saying that just because he was my Dad. It was pretty great to see them all working together. Now, all of the grandkids are in their 20’s and 30’s and it’s great to see the hardware store influence on them. They all have a little MacGyver in them when it comes to fixing and making things. Recently Ryan had to do some remodeling. He replaced all of the interior doors in one part of his house. It takes some effort to route and mount the hinges properly, and install the doorknobs. Maybe this has something to do with the fact that he spent time with his grandfather at the store before school pretty often when he was young. I get a kick out of seeing him repairing stuff at his house and it reminds me of my Dad. 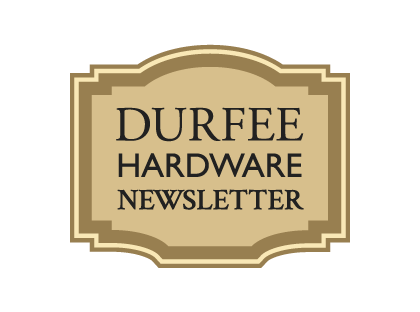 You’ll be hard-pressed to buy something from Durfee’s that someone in the family hasn’t used on a job. You’ll certainly be able to get the benefit of our experiences when you visit. I used what was left of the warm weather to do some painting. As I mentioned last month, the Wet & Forget stuff to get rid of mold, etc. from your clapboard and roof is pretty fantastic. I used that and then painted the dormers on my garage. I also started some electrical work in my garage as well. I only had three lights, which left one area of the garage very dark. I put up a fourth light so I can actually see what I’m doing now when I’m working with my tools. Funny, the garage has been there for years and I am just now getting around to adding some more lighting. Probably has to do with my eyesight showing the signs of my age.